Since we get asked often, we wanted to provide some quick “how to” guides on using bankruptcy information in your business -- either as as a real estate investor looking to purchase, or as a real estate agent looking to facilitate a transaction. This will be a four part series covering the basics to more advanced techniques in identifying residential real estate opportunities. We hope you will find the articles helpful. Should you have any questions or interest in other topics, please let us know. We would love to hear from you. If you prefer, you can also schedule a 15 minute web demo so you can see for yourself how to get started. In Which District/Venue Should You Purchase the Asset? In this last of our residential real estate in bankruptcy series, we’ll discuss how to find properties listed in the bankruptcy schedules, who the secured creditors are, and how much debt is owed on the property. This information can lead to opportunities to make stalking horse bids to the trustee or even purchase the secured debt from the lender. 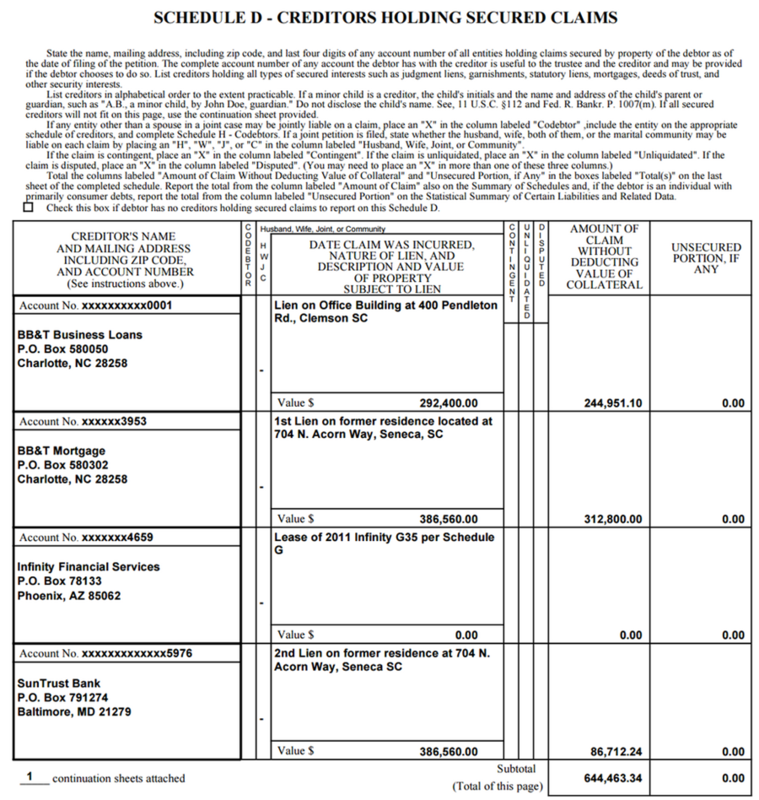 A myriad of forms is required to commence a bankruptcy case. The “petition” is the first of these and is a simple 3-page form identifying relevant information about the debtor and type of bankruptcy getting filed. Along with the petition, the debtor must file a host of “schedules” identified by alphabetical order as schedules A through J. The schedules provide a detailed breakdown of the debtors assets, liabilities, income and expenses, and other pertinent facts regarding the debtor’s circumstances. Schedules may or may not be filed with the petition itself. Typically they are all filed together, in which case you will see a 30+ page document (or packet). However, by law, the schedules may be filed up to 14 days later (give or take a day depending on the jurisdiction). If filed separately, the petition (entry #1 on the docket) will usually be less than 10 pages. For example, in this case, the voluntary petition was filed on November 14, 2014, while the schedules were filed on November 26, 2014. From the Summary of Schedules we can get a quick summary of the case. As it shows below, the debtor filed $793,960 in real property with $776,403.34 in secured debt. In Schedule A - Real Property, we can dig deeper into the real property. As the schedule below shows, the debtor had a former residence located at 704 N. Acorn Way, Seneca, SC (Oconee County) (tax value shown) (foreclosure pending); a condominium located at 60 Fenwich Hall Allee, Unit 234, Johns Island, SC (Charleston County) (co-owned with ex-spouse - full tax value and debt amount shown); and an office building located at 400 Pendleton Rd., Clemson, SC (Pickens County) (tax value shown) (foreclosure pending). Next, we’ll look at Schedule D - Creditors Holding Secured Claims. As this schedule below shows, there are four creditors, three of which have debt owed to them namely, BB&T Business Loans, BB&T Mortgage, and SunTrust Bank. Now that you are armed with the facts of the case, you can dig through the rest of the schedules and determine if there is enough equity value in the estate to provide a return to the unsecured creditors. If so, you can try to buy the secured debt and / or make an offer on the asset to the Trustee. If you are able to purchase the debt from the lender, then you’ll be in charge of foreclosing on the home to take possession of the title. That ends our four part series on buying residential real estate. Have fun hunting and finding your niche in the dynamic world of real estate and bankruptcy! Just as we discussed in the last article, there are short sale leads from chapter 13 and chapter 7 cases. This article will cover leads from chapter 7 cases. When a homeowner / debtor files for bankruptcy, the debtor is granted an automatic stay. An automatic stay prohibits creditors from taking collection activities while the bankruptcy case is proceeding. This provides immediate relief to the debtor and allows for an orderly administration of the bankruptcy estate. If the homeowner is behind on their mortgage payments, the secured creditor will typically file a motion for relief from stay. This is a request to the court to allow that creditor to continue collection, which for real property equates to a foreclose. The court will usually lift the stay if the if there is no equity in the property and if the property is not necessary for an effective reorganization. These two conditions are typically met in a chapter 7 case. When the relief from stay is granted by order of the court, the lender can continue to foreclose. At this point, the debtor faces the difficult reality of going through a foreclosure or finding some other means of moving on from the property. In such cases a short sale is a great alternative, for reasons mentioned in the previous article (stay longer in house and potentially get cash to move). Please note we flag the short sale as the more likely alternative in this case because there is typically very little to no equity in a property where relief from stay has been granted by the bankruptcy court. This is different than a dismissed chapter 13, which typically is used to save a home that has equity. While there are always exception to a rule, these are the general workings regarding bankruptcy cases. On Inforuptcy, you can set up alerts to track cases across the country to find cases where the relief from stay was ordered as illustrated with the image below. Once a case has been identified, you can purchase the Party query to find the debtor’s address, attorney’s contact information and creditor’s contact information. Now you have all the information needed to contact all the parties and negotiate a short sale. As we have discussed in this article, Inforuptcy can be used as a valuable marketing and lead generation tool to find real estate sales opportunities. We often get asked by real estate professionals if we could help them find real estate leads from bankruptcy case information. The answer is a resounding -- yes. There are two ways to find these leads. Below we will discuss finding leads from a chapter 13 case. Next, we’ll discuss finding leads from a chapter 7 case. Chapter 13 is a specific type of bankruptcy geared for homeowners. It allows debtors who have fallen behind on their mortgage payments to reorganize their financial affairs by "making up" their mortgage arrears through a court approved repayment plan. If the debtors are able to continually make their plan payments, their Chapter 13 case proceeds forward. If they can't make their payments, the bankruptcy case gets dismissed. Once dismissed, there is no bankruptcy protection and the mortgage lender may proceed with foreclosure. In fact, many times a Chapter 13 case is filed to stall a foreclosure and gets dismissed within weeks after filing. Regardless of the exact circumstances, once a bankruptcy case is dismissed, homeowners look for other solutions such as a sale, short sale, a deed in lieu, or other possibilities that would allow them the relief they are seeking. To sum, debtors who had their Chapter 13 case dismissed are good candidates for some type of a real estate transaction. Below is an instructional video walking you through the spreadsheet. To sum, the information in the spreadsheet we email every week contains all the parties’ relevant information needed for a real estate agent (or investor) to reach out and put together a real estate transaction. In the event the circumstances of the case favor a short sale, it’s good to know that there are benefits for both sides. The bank benefits by avoiding the legal cost of a foreclosure, the financial cost of putting the real property on the bank’s balance sheet, and the hard cost of maintaining the property. The debtor benefits because they might be able to stay in the house longer during the sale process. In some cases, the bank may also provide a cash incentive to the homeowner to consent to a short sale. For example, Bank of America and Wells Fargo offer programs that compensate for relocation expenses.